When you need legal help with serious business problems, you want a law team that returns your calls, that has deep familiarity with statutory as well as case law, and that understands how your industry works. The ideal firm is quick to respond, sensitive to cost and respected by its peers. Nissenbaum Law Group, LLC, a boutique business law firm, has been awarded the highest peer rating* (AV) by Martindale-Hubbell. Our complex commercial litigation lawyers take your case and your business objectives seriously. We provide transactional and dispute resolution services to businesses in nearly every sector, including health care, construction, real estate, franchising, Internet and nonprofits. Our firm has successfully pursued complex commercial litigation in many states, pursuant to existing rules and guidelines. We point with pride to our promise to strive to return our clients' phone calls or emails at the earliest possible opportunity. We do not want any client, ever, to be in the dark about the matter at hand. 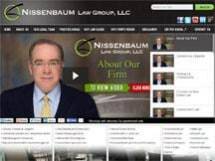 In New York City, call Nissenbaum Law Group, LLC, at 908-686-8000. Have our attorneys demonstrate this commitment to you.